Excavations of Masada were not seriously undertaken until the 1960s when Masada became part of Israeli territory. With the help of twentieth century technology archeologists were able to access this natural fortress that had been largely untouched for nearly two thousand years. 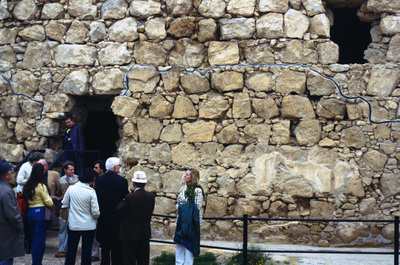 This photograph shows visitors at the ruins of King Herod’s Palace, built by King Herod in the first century BC. Later it was used by the Zealots, approximately 900 Jewish rebels who held the fortress for seven years before it was over taken by the Roman Army in AD 74. Smolski, Chet, "Masada: Tourists and Ruins" (1980). Smolski Images. 783.